Our staff, board members, volunteers & guests all enjoyed themselves at the Volunteer Appreciation Social held in October at Shadows restaurant. Renee Held & Lisa Rosendahl at the Volunteer Appreciation Social in October at Shadows Restaurant. Several of our volunteers including Brenda Vermeire, along with our staff, have had the opportunity to attend different training workshops in Norfolk recently. Several of our volunteers including Carrie Trofholz, along with our staff, have had the opportunity to attend different training workshops in Norfolk recently. Several of our volunteers including Rhonda Scott & Renee Held, along with our staff, have had the opportunity to attend different training workshops in Norfolk recently. Several of our volunteers, along with our staff, have had the opportunity to attend different training workshops in Norfolk recently. New CASA volunteers, Tami Altstadt and Annette Davis along with Lisa Rosendahl, being sworn in by Platte County judge, The Honorable Frank J. Skorupa. 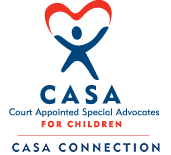 CASA Connection received a $500 check this week from BD to match the volunteer hours of their associate, and our own Tracy Duncan.